October is breast cancer awareness month. For our next challenge we invite you to find a data set related to breast cancer. The visual above is the subject of Makeover Monday 2018/week 41 analyzing Five Year Cancer Survival Rates in America. The data can be found on Data.World. Below are links to additional data sets you may use. Feel free to find another data set or join data sets for greater insight. The data set you use does not have to be limited to breast cancer. If a visual is provided with the data, please include the image or link to the visual with your posting. Participants may use Tableau or any other data visualization tool (Excel, SAS, R..) to create their visual. Makeovers will be discussed at the monthly TUG meeting. The challenge winner, selected by random drawing, will be announced at the monthly TUG meeting. The winner can choose any book from Amazon about data or visualization up to $100! Submit your entry by responding to this discussion. Please limit one submission per person. You may update your submission at any point up until the deadline. If you have questions while creating your visual, post your questions here! To ensure your visual is shared at the next TUG, please post your visual to this discussion by 5PM EST on November 12th. For this month challenge, I worked with @Sybil_D on a heat map. Attached is the PDF for the heat map. 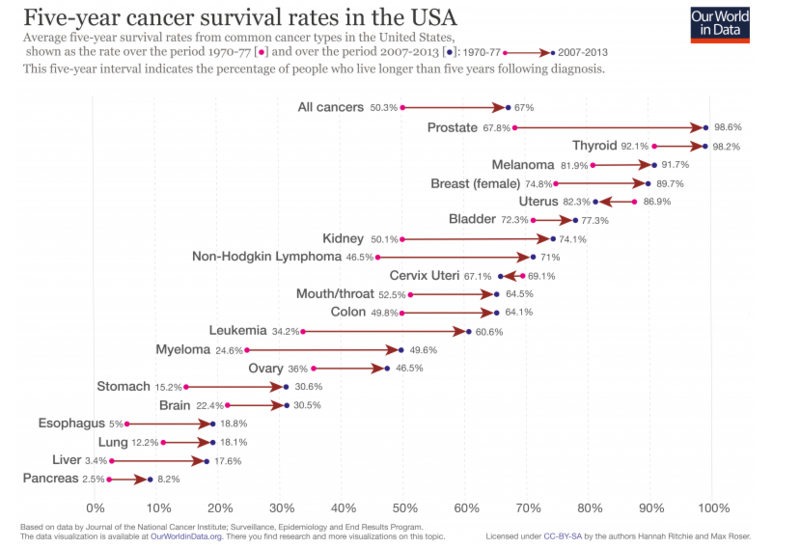 It shows the 5 year survival trends over the years of different types of cancer by race and gender. @Seif @Sybil_D Nicely done! A heat map effectively displays the change in survival rate over time. Attached is the PowerPoint from today's meeting. Congratulations to @Seif our challenge winner! Please view the PowerPoint for additional makeovers found on data.world. Please provide any questions/comments below. During the meeting we split into two groups (Albany and Lake Success) to see what visuals we could create within a 10-minute time frame. Attached are the two workbooks created. The Albany offices intent was to show the change in survival rate over the years based on gender and race. We ran out of time before we could add shapes to distinguish categories and customize filters. If you create a visualization utilizing this data set, please comment below and share your visualization with the group!